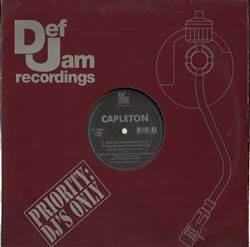 Capleton - Hurts My Heart 12"
REGGAE, Def Jam, USA, 1997... With Hurts My Heart (Radio Edit), Hurts My Heart (Instrumental), Na Bow (Do Now). Mega Banton - Money First 12" Super Cat / Shabba Ranks / Brandy - Scalp Dem / Let's Get It On / I Wanna Be Down 12" Ken Boothe - Say You 12" Chaka Demus & Pliers - Mr. Mention 12"
Various - La Calle Volume One 2X12" Terry Ganzie - Treat The Woman Right / King Of Kings 12" Ninjaman - Bounty Hunter LP Various - Reggae Classics Volume One 12"